In this blend Tulsi is combined with Green Tea to create an antioxidant-rich tonic that increases energy levels, while cooling and balancing your senses. It is simple and subtle, yet provides wonderfully restorative powers. Enjoy as a rejuvenating hot tea or serve iced for a refreshing pick-me-up! Tulsi (Holy Basil), Queen of Herbs, the legendary “Incomparable One”, is one of the holiest and most cherished of the ancient healing herbs of India . Tulsi is renowned for its spiritual sanctity, as well as for its central role in the Ayurvedic and Unani systems of holistic health and herbal medicine of the East. Tulsi’s unique restorative properties make it an ideal supplement to help cope with today’s stressful and challenging environment. 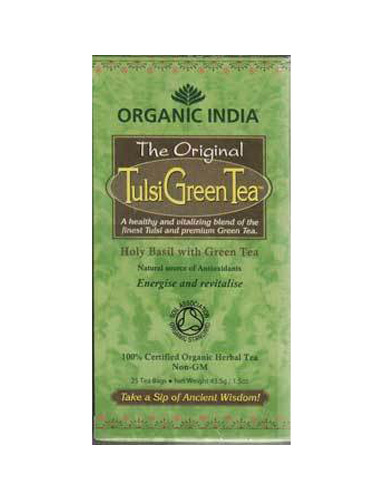 Renown as a general tonic and vitalizer, The Elixir of Life, Tulsi is used in hundreds of different traditional herbal formulations and is enjoyed as a simple, delicious tea. Use one tea-bag per cup. Pour boiling water over tea-bag in cup and infuse for 3 minutes or more, as desired. Serve plain or with sweetener,. Enjoy the rich aroma and the refreshing flavour of this unique tea. For a soothing and refreshing iced tea, follow the same procedure. Let the tea cool and refrigerate. Add ice if desired and serve, Double the strength when adding ice. ORGANIC INDIA tea bags are individually wrapped top preserve freshness, flavour and beneficial properties.